A place to post any ELO or related sightings or when you hear a record played on the radio, in a shop or elsewhere. Jeremy Vine on BBC Radio 2 today played "Summer and Lightning" I was very shocked I don't think I've heard this on the radio before. I heard that too, it stopped me in my tracks! I think 'S&L' has been played a few times and seems quite popular on Radio 2. This puzzles me because I don't think it was ever a single. This morning on the BBC's Commonwealth Games coverage I was surprised to hear them using '10538 Overture' in a feature about cyclist Bradley Wiggins. At first I thought it was the Paul Weller song (Wiggo is a big Weller fan) that shamelessly borrowed from the tune but is wasn't, it was the original. The song and cycling seem go together well. My kids used to absolutely adore the Idle Race Birthday Party album, it's brilliant for little 'uns. You can have loads of fun singing along especially to the likes of Mr Crow and Sir Norman. And the "ba boo ba boo ba boo bay" ending of Lucky Man. Telephone Line covered by "She Hates Me". Too bad we only got the first half of the song on video. Lucky Man...heh heh....love that...fab little track....as i was swimming in the sea i came across a bomb or three.....oh my...! Happy to see Jeff and ELO on tonight's 6/9/1979 episode of Top of the Pops on BBC4 www.bbc.co.uk/programmes/b04j8w5s Playing 'Don't Bring Me Down'. Mr Blue Sky was used a number of times on Waterloo Road tonight on the BBC. The ELO version was used for a good few minutes at the start and then towards the end a version by a female singer (Lilly Allen?) was used. 10538 Overture was played at the beginning of tonight's Match Of The Day. Most unexpected! 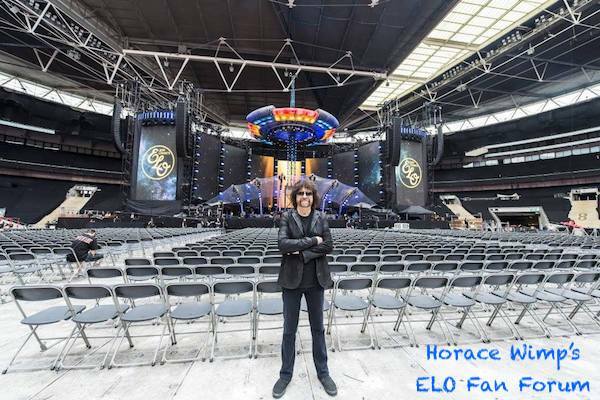 "Last Train to London" today on the radio while driving, accompanied by a briefing on ELO. Telephone Line came on when in the car with Hubby the other day. He looked at me and turned the radio off. In 22 years there's been a few times!